(B) Making of the inspiring documentary film on Bharat Ratna Lal Bahadur Shastri “A Hero Of War & Peace” – a Nation Building Project. “Come India Sing For Nation Building” – an inspiring talk by Aubrey Aloysius on nation building utilising music, art & culture for skill development, character building, motivation, inspiration, team building and leadership development. We take this opportunity to invite you, your family and your organisation to participate in the Nation Building Project “Come INDIA Sing” and make a mark on the next generation of India. The Project is conceptualised and initiated by LAMP Trust aided by Lorraine Music Academy . WHY SHOULD ONE DONATE MONEY? We have launched the Nation Building Project “Come India Sing Jana Gana Mana” to encourage responsible citizenship as envisaged in Article 51A of the Constitution of India. Our educational objective is to expose children and adults to Indian and International Music, Art, & Literature and thereby inspire & motivate them to take up learning of a musical instrument (Piano, Guitar, Electronic keyboard, Violin, Drums, Singing…) to sing and to express themselves through performing arts and literature. This will include educative workshops & concerts. Our long term focus is on raising world-class creative talent by building world-class inter-disciplinary creative and performing arts’ training and educational institutions. This will enable skill & talent development across the nation’s socio-economic strata. Such centres of excellence will be one of the keys to unlocking the potential of India in the Arts sector in the coming years. We have successfully conceptualised and implemented projects and events which have received wide publicity and have resonated very much with society. DONATIONS ARE WELCOME towards our Nation Building Projects. Donations to LAMP Trust are exempt from Income Tax (50% of the donation is tax deductible) as per Section 80G of the Income Tax Act. Please click below to checkout our NEWS section. 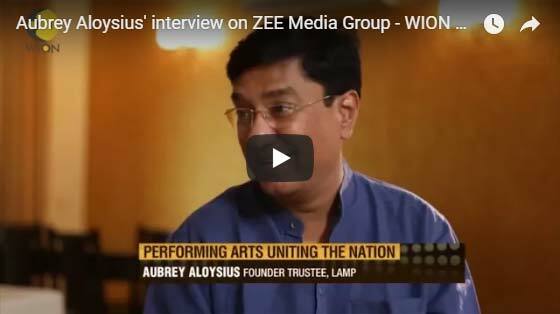 Aubrey Aloysius' interview on ZEE Media Group - WION TV - Channel's "Bollywood Boulevard" program telecast across India & 37 countries on Independence Day 15 August 2017, as India celebrates 70 years of freedom... taking us through a journey of how music, art & culture has united the nation!